The recent upgrade to thunderbird-3.0.3 rendered the virtual identity extension unusable due to a version conflict. The virtual identity extension allows you to edit the sender field when composing a new mail. Furthermore it warns you when trying to send a mail to a recipient you used another sender address for, before. This is especially useful if you use multiple accounts in thunderbird since you surely don´t want to write business mails from your private mail account. The extension itself works with thunderbird-3.0.3, but thunderbird-3.0.3 is not in the range of compatible versions specified in the Addon package. It is possible to override this. To do so install MR Tech Toolkit via Tools->Addons and restart Thunderbird. Now, when installing an Addon you get an additional checkbox to deactivate the maxVersion test. Also in the context menu of the extension list there is now a menu entry “override compatibility” which allows you to activate installed Addons that fail the version test. Afterwards you can activate or install virtual identity again. Edit: V0.6.4 is out and the procedure described above is not necessary any more for virtual identity. I´m running gentoo linux x86_64 on my dell laptop. Today mail-client/mozilla-thunderbird-3.0.3 was aviable in portage and so I upgraded, but there was no lighning for Thunderbird 3 in the portage. Since I need the calendar in thunderbird I searched the web for a solution. After short time I found it in google groups. Download the lightning.xpi from http://mozilla.osuosl.org/pub/mozilla.org/calendar/lightning/releases/1.0b1/contrib/linux-x86_64/ and install it via Tools->Addons. Now have fun with your new Thundebird. Some years ago I played nethack on my old PC. 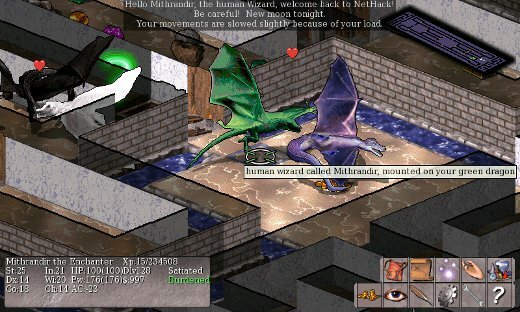 Nethack is a Diablo like RPG that was originally released in 1987. Before playing a game, you have to create a character. You can choose between different character classes: Archeologist, Barbarian, Caveman, Healer, Knight, Monk, Priest, Ranger, Rogue, Samurai, Tourist Valkyrie and Wizard. These classes have different abilities in fighting and using magic. 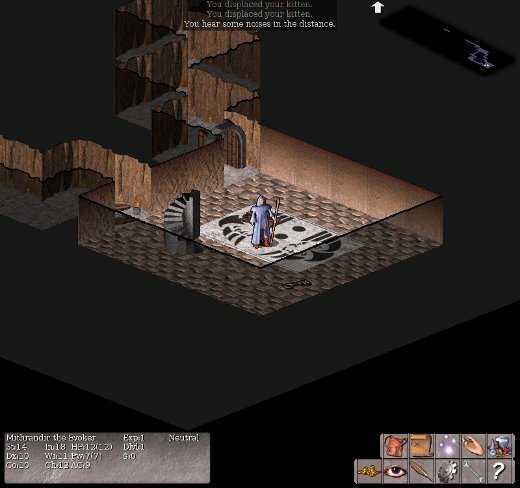 Afterwards you can descent to the dungeon where you have to retrieve the Amulet of Yendor and defeat the bad Moloch. For some more information on gameplay and how to win see the links below the post. By chance I discovered a maemo package for vultures eye which I installed on my Nokia N810. Vultures eye is a nice graphical frontend for nethack. Then just emerge vultures and enjoy many YASDs. But beware, one can get quite addicted to this game. I have searched for a 3D game on Linux and found this nice flight simulation. In Gentoos portage tree there is only an old version avaiable, so I wrote an ebuild for the new version. It compiles fine on my computer wth 64bit Gentoo – Linux. The Power of my graphics board (nVidia Corporation Quadro FX 360M) seems to be enough for this simulation. The control is not easy, but with some time, you can fly around, like in a real aircraft. The FlightGear flight simulator project is an open-source, multi-platform, cooperative flight simulator development project. Source code for the entire project is available and licensed under the GNU General Public License. Now it´s in portage, with two different lines. First of all I found out that freeglut 2.6 is needed for flightgear, so I put it in the ebuild. And the second is a patch witch is needed if you don´t use freeglut 2.6. So I think my choice is the better way.